Description: From 2-1/2 to 3-1/2 feet tall. Leaves are long oval like, toothed and hairy. 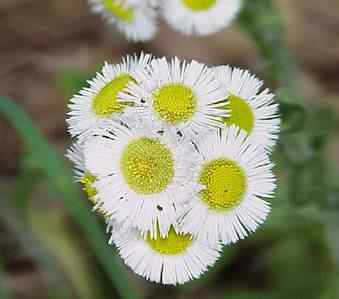 Flowers are daisy like with yellow centers and numerous whit rays about 40 - 70. Similar species E. strigosus has fewer leaves most of which are not toothed or only slightly. The hairs lie closer to the stem,and do not spread.